Though we've spent a lot of time writing about laptop / tablet hybrids running Windows 8, we've so far spent precious little time actually playing with them. In part, that's because we've been so preoccupied reviewing convertible Ultrabooks, but it's also because many of the biggest-name hybrids have only just begun to go on sale. That means, then, that we haven't gotten to test any new Samsung devices: both of the company's new Windows 8 offerings take on the hybrid form factor, with one packing an Atom processor and the other, an Ultrabook-grade CPU. The problem is, even if you can do without that LTE radio, that's some lofty pricing: competing WiFi-only tablets cost between $500 and $600 with no dock. Even if you'd rather have the whole package, it's possible to find a similar model for $850, keyboard included. So is there any reason to pay a premium for this particular model, let alone sign on AT&T's dotted line? Let's find out. 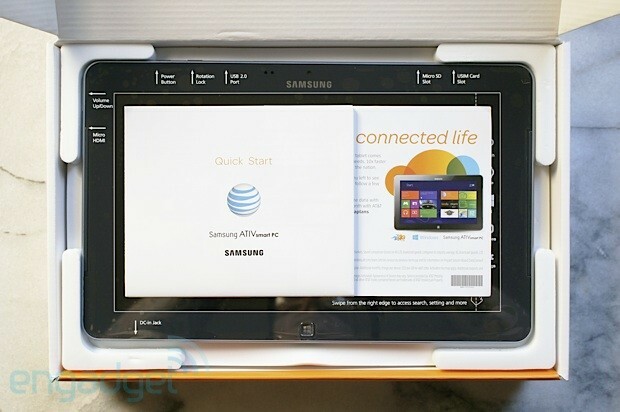 Samsung's ATIV Smart PC holds promise as a Windows 8 hybrid, but the AT&T version is buggy and expensive with fewer features. How would you rate the ATIV Tab 5? Samsung might be dabbling in a new OS, but its approach to hardware hasn't changed a lick. The Smart PC represents everything we've loved and hated about the company's tablet designs, which is to say it's comfortable to hold, but feels cheaply made given the high price. Starting with the back cover, Samsung went not just with plastic, but plastic painted to look like brushed metal. It brings back memories of Samsung's older tablets, like the Galaxy Tabs 8.9 and 7.0 Plus, except here the lid has a slick, shiny finish that makes the whole thing feel just a bit tackier. We'll say this, though: we expected it to be thicker and heavier than it actually is, given that it makes room for a full-sized USB port and a large 4,080mAh battery. To be clear, it is actually heftier than the competition, at 1.65 pounds and 0.39 inch thick. The HP's Envy x2, another 11.6-inch, Atom-powered Windows 8 tablet, weighs 1.5 pounds and measures 0.33 inch thick, to make just one comparison. Still, the difference never bothered us much. This doesn't feel like a heavy tablet, per se. But it does feel like an unwieldy one at times. You see, the problem isn't that it measures 1.5 millimeters thicker than something else on the market. It's that an 11.6-inch tablet is clumsier to use than a 10.1-inch one. In landscape mode, for instance, it might be difficult to reach the middle of the onscreen keyboard with your thumbs, depending on how small your hands are. If you have really tiny hands you'll struggle with typing in portrait mode, too. Even if you don't, though, the weight distribution is still stacked in such a way that it can be burdensome to hold up the tablet in portrait mode while you type in URLs or answer emails. All told, we felt more at ease using the Acer Iconia W510, which has a smaller 10-inch display. The good news, of course, is that many of the touch-based controls in Windows 8 sit along the edges of the screen, so those, at least, are easy to find with your fingers regardless of whether you're using a 10-inch tablet or a 13-inch convertible. An 11.6-inch tablet is clumsier to use than a 10.1-inch one. We mentioned that the Smart PC is home to a full-sized USB 2.0 port. It's worth mentioning that other Windows 8 hybrids such as the x2 offer this too, except you'll more commonly find it on the keyboard dock instead of the tablet itself. We actually think that's the smarter move, since it's less likely folks will want to access the USB port when they're using the PC in tablet mode. That said, given that AT&T is selling this for $800 without a contract and with no keyboard included, that USB placement could be a good thing in that you won't need to pay $130 extra just to have that feature. Nestled along the top edge, you'll find the requisite USIM slot, along with a microSD slot allowing you to expand upon the device's 64 gigs of built-in storage. Nearby you'll also find the power button and a switch for locking the screen orientation. On the left landscape edge is a micro-HDMI socket, along with the all-important volume rocker. On the bottom (still in landscape mode here) is where the power port sits, along with those necessary docking slots. Up front, as you'd expect, is a webcam for video chatting. There's also a rear camera module, an 8-megapixel unit paired with an LED flash (more on that later, of course). Regardless of whether you purchase the LTE version from AT&T or the WiFi-only model through some other retailer, the tablet packs all the sensors you'd expect to find on a modern tablet: an accelerometer, gyroscope, magnetometer, ambient light sensor, Bluetooth 4.0 and dual-band 802.11a/b/g/n. It's also DLNA-capable and has an embedded NFC chip. In the case of the AT&T version, though, it also supports AWS LTE (natch), HSPA+ and UMTS 3G (850/1900/2100 MHz). 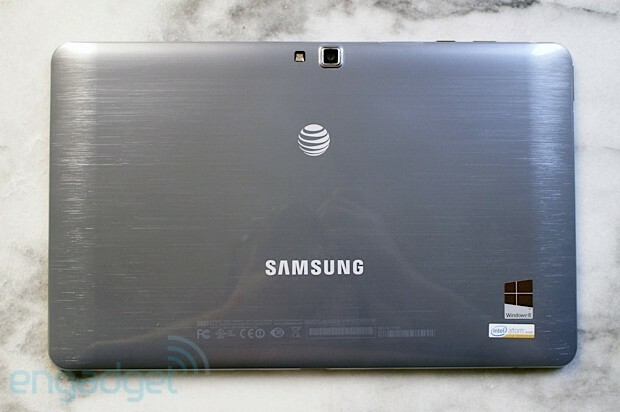 When we originally tested Samsung's ATIV Smart PC, it was without the optional keyboard dock. The accessory eventually landed in our lap just before the holidays, so we took the opportunity to update our review. For $130, the keyboard dock buys you a nice chiclet keyboard, a mediocre buttonless trackpad and two standard USB 2.0 ports. The complete hybrid system ends up being noticeably heavier and thicker than an 11-inch MacBook Air -- not quite as slick but by no means bulky. 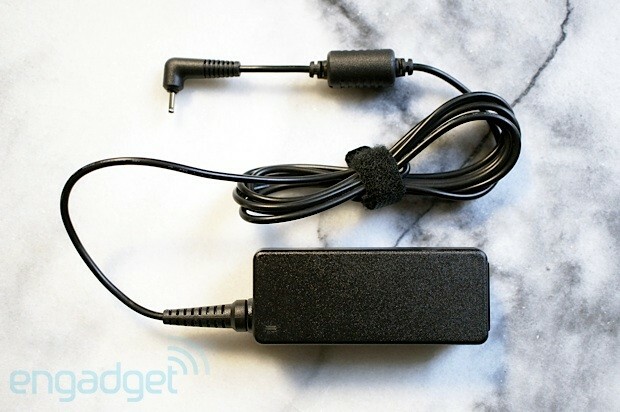 Unlike the keyboard dock available for ASUS' Transformer series, Samsung's accessory lacks any kind of built-in battery, which is disappointing. 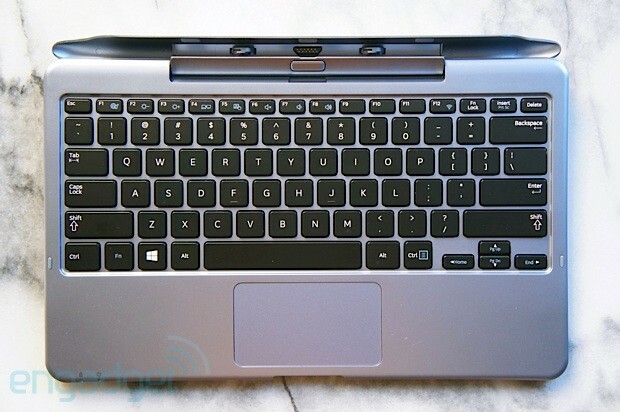 The keyboard dock is housed in a plastic shell that matches the bluish-gray hue of the ATIV Smart PC, but skips the shiny, faux brushed-metal finish for a less durable satin paintjob. Some kind of aluminum alloy makes up the hinge into which the tablet slips, which, along with the trackpad, is the same color as the casing. A black island-style keyboard with white labels completes the package. You'll find four rubber feet on the bottom of the accessory, two LEDs (caps lock and power) to the left of the front edge, the power connector plus one USB 2.0 socket on the left side and a second USB 2.0 port on the right (both USB interfaces are covered by a plastic flap). There are just too many unresolved issues to recommend this accessory. Docking the ATIV Smart PC for the first time requires removing plastic plugs covering slots on either side of the dock connector at the bottom edge of the tablet. The PC clicks in place when two hooks inside the hinge latch with the aforementioned slots. Once attached, there's no way to access the tablet's power connector, which is why Samsung's replicated it on the keyboard dock. A button on the hinge lets you unlatch the mechanism, and small Teflon pads inside the hinge protect the PC from scratches when it's being inserted and removed. The dock connector consists of two staggered rows of pogo pins (12 total) on the keyboard dock, with matching contacts on the tablet. Unfortunately, it's not the most reliable setup: there's enough play in the hinge mechanism that we regularly experienced connection problems between the PC and its accessory -- like when adjusting the angle of the screen, for example. Speaking of which, we felt that the display could not be tilted back far enough compared to most laptops. You'll find the buttonless trackpad finicky at best. It handles two-finger scrolling reasonably well (better than most Windows machines), but we experienced recurring problems with one-finger clicks being interpreted as two-finger clicks. It's also a bit small. On the plus side, the chiclet keyboard is satisfying -- it looks and feels similar to the keyboard found on Samsung's recent Chromebooks. The layout is intuitive, with an Fn key used to access special functions like brightness and volume. Ultimately, our takeaway for this keyboard dock echoes what we wrote for the ATIV Smart PC itself: there are just too many unresolved issues to recommend this accessory. The dock connector is not electrically reliable enough and the trackpad is hopelessly frustrating. It's hard to justify spending $130 on a battery-less keyboard dock that should be bundled with the tablet (it's pretty much required if you want to use the Desktop UI). The lack of an SD card slot and headphone jack on the accessory itself makes this PC awkward to use when docked. At least the keyboard is good, right? We've already made the point that an 11-inch screen can be a little awkward to use in tablet mode, at least if you plan on doing a lot of typing using the onscreen keyboard. But what about the panel itself? Not bad. But also not great. On the one hand, the screen uses Samsung's own PLS technology, which rivals IPS when it comes to providing wide viewing angles. Indeed, we spent weeks testing this without a keyboard dock, so we know what it's like to rest the tablet face-up on a table and watch a movie. Even from an off-angle like that, it's easy to follow along. But -- and there's a couple "buts" here -- the screen is just barely bright enough to use in direct sunlight. Cranking the brightness all the way up certainly helped us do a better job of framing photos on a sunny day, but even then we had to squint -- and wait until we got inside to see if our shots came out okay. What's more, the tablet's 1,366 x 768 resolution translates to a pixel density of just 135 ppi. That's still usable, of course, but it's disappointing in a tablet this expensive, and it also feels increasingly inadequate when companies like Apple, ASUS and Acer are all pushing the envelope with higher resolutions (2,048 x 1,536 on the fourth-gen iPad and 1,920 x 1,200 on the Transformer Pad Infinity and Iconia Tab A700). A dual-core, 1.8GHz Atom-based Clover Trail CPU with 2GB of RAM. The same specs you'll find on most every other laptop / tablet hybrid running Windows 8. So, the performance should be roughly equal, right? You'd think, but as we found with all those Tegra 3 tablets we reviewed earlier in the year, a lot can vary from brand to brand, or even device to device. Setting aside any issues about Atom's slowness (some of which are myths anyway); this is simply a buggy tablet. Several apps crashed during our testing, including Internet Explorer and the stock camera program. Similarly, a few froze, forcing us to perform a hard reset. The camera app, in particular, went berserk several times when we tried to switch to video mode. Mind you, we haven't experienced problems like this on any other Windows 8 device we've tested. The Metro version of IE also froze more than once, and occasionally the screen failed to respond when we tried to swipe in from the side to toggle through open apps. The accelerometer, meanwhile, is often slow to pick up on changes in orientation. Worst of all, we noticed these issues on two different review units. A Samsung rep told us the company doesn't have anything to share regarding a possible firmware update, though AT&T confirmed to us that there are indeed some software improvements coming. On the desktop side, we found that apps like IE 10 and Windows Media Player were often so slow to launch that we questioned whether the tablet even picked up on the fact that we had double-tapped these shortcuts in the first place. That bodes poorly if you were hoping to use this as an occasional laptop replacement. Why might you spend $700 on a device like this? Lingering on the desktop a moment, you can also forget gaming, too: though the Smart PC should technically run many legacy x86 games, its integrated Intel Graphics Media Accelerator yields a 3DMark06 score of just 374. In the disk benchmark ATTO, meanwhile, its read and write speeds topped out at just 82 MB/s and 36 MB/s, respectively. We'll venture to say we don't expect much better of other Atom-powered tablets; if anything, the buggy performance is the bigger crime here. Still, as we go through the list of possible use cases for this thing, it's worrisome that we have to cross mundane tablet tasks and desktop productivity off the list. If the Smart PC offers unreliable performance in tablet mode and is too sluggish to get much done in desktop mode, why might you spend $700 on a device like this? 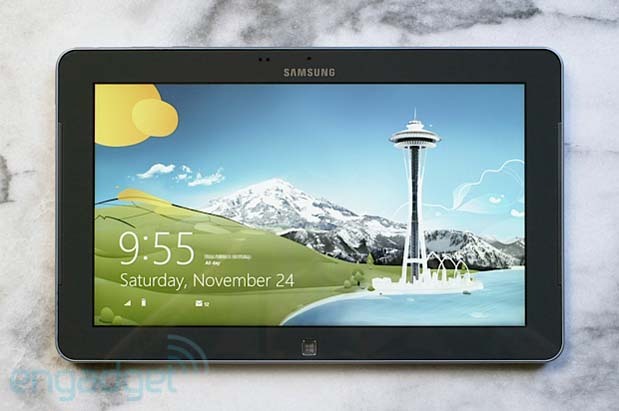 According to Samsung, the LTE version of the tablet should last up to seven hours on a charge. Sounds about right to us. With WiFi on and LTE off, the 4,080mAh battery lasted through seven hours and four minutes of video playback, with the screen brightness fixed at 65 percent. When we connected to LTE and left the WiFi radio on, we got six hours and 43 minutes. As it happens, other Atom-powered Windows 8 tablets are promising similar battery life, and since this is an x86 processor and not an ARM chip, we would never expect it to last as long as, say, an iPad or a Nexus 10. The thing is, when the device is this poky and AT&T isn't selling a keyboard and you're paying $700 on contract, you have to wonder how worthwhile it is to have a PC-grade chip inside. For what it's worth, the built-in LTE radio performs as well as advertised. With a full signal, we recorded peak download speeds of 27.5 Mbps and max upload speeds of 14.5 Mbps, though performance tended to average out at around 10 Mbps (both up and down). In testing around New York City and San Francisco, we also noticed that upload speeds were sometimes higher than download speeds, particularly in situations where we only had an average signal. Samsung has erased all evidence that this was ever a pen-enabled tablet. We often rail on carriers for loading up their devices with bloatware, so it's nice to see that AT&T's version of the Smart PC contains scarce little pre-installed software. All we have is a Live Tile showing data usage, along with the Kindle reader, Slacker Radio, Microsoft Office, Plants vs. Zombies and Jamie Oliver's Recipes, randomly enough. Samsung also bundled a couple programs of its own, including S Player for video playback, the aptly named "Photo Editor" and, of course, that secondary camera app we mentioned. What's interesting are the apps not included on the device. When Samsung first gave us a demo of the Smart PC, the tablet had pen support, and came with Samsung's various S Pen apps. In fact, if you buy the WiFi model off Samsung's site, you'll see the company is still touting these features, and even includes an S Pen in the box. Pick up the LTE version, though, and you'll find Samsung has erased all evidence that this was ever a pen-enabled tablet. There are no S Pen apps installed on the device, and you can't download them off the product support website. There's also no pen in the box; heck, the hardware no longer responds to pen input, so even if you supplied your own pen, it still wouldn't work. To be fair, when we've previously described Samsung's S Pen suite as more of a nice-to-have feature than anything else, but even so, we can't wrap our minds around a company removing functionality from a device, only to charge more over the long term. Back when we first saw the device, Samsung also showed us some custom apps designed to make Windows 8 a little easier to use. 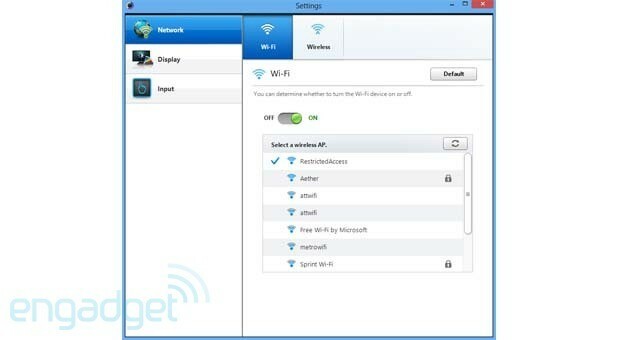 These included Easy Settings, a desktop app where you can manage wireless networks, display options, etc. without having to flip open the Charms Bar. There was also S Launcher, a desktop widget designed to replace the old Start Menu, and AllShare Play, an app that lets you stream media files to DLNA-compatible devices, like televisions. As it happens, these don't come installed on the device, either; you'll need to download them from Samsung's support site. The problem is that if you go to the product page for AT&T's version of the Smart PC, specifically, you won't find any of these apps. To find Easy Settings, we had to go to the product page for the WiFi-only version of the tablet, which goes by "ATIV Smart PC 500T" -- not the most obvious name in the world. Even then, we weren't able to find a download link for S Launcher; just Easy Settings. AllShare, meanwhile, comes as part of a more nondescript file called "Software package"; here, too, you'd have to already know where to look if you wanted a chance at finding anything. There's only so much you can do with a tablet camera, especially when the stock Windows 8 camera app is so light on customizable settings and scene modes. Still, the 8-megapixel camera (also capable of 1080p video) captures some decent shots, with colors more or less balanced. (Check our gallery and you'll see some photos where reds and oranges appear oversaturated.) 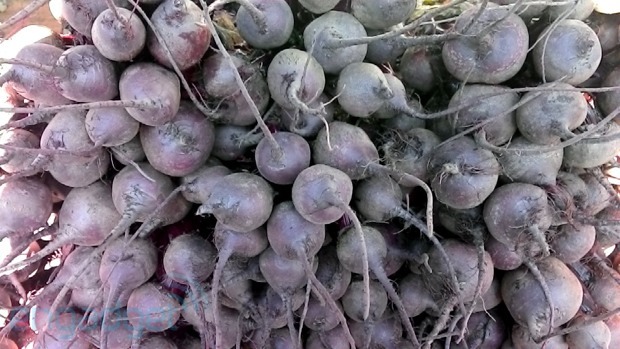 Occasionally, too, we ruined our own shots by not waiting past the shutter lag, but most of our sample photos were sufficiently crisp, especially after we scaled them down to a more web-friendly resolution. In addition to the native camera app, Samsung also included its own, a program called S Camera. Unlike ASUS, which has been bundling a camera app that mimics the UI on the stock version, S Camera has a completely different layout, along with different icons and options. Notable features include one-touch flash controls, a sliding lever to toggle between video and stills, and manual brightness, contrast and exposure controls. What's especially interesting is that while the Windows app uses the whole screen as a shutter, Samsung's app takes a more traditional approach with a dedicated shutter. It's an improvement only because it feels more familiar; either way, you can't tap to focus, so it's not like Samsung is saving all that screen space for something else. It should go without saying, but if you're going to buy the LTE version of the Smart PC, you're going to buy it through AT&T. To recap, the price is $800 without a contract, and that price doesn't include a keyboard. (AT&T has not begun selling the keyboard, but you can find it through other retailers for $130.) If you do sign a two-year contract, the up-front price of the hardware drops to $700. Not a big enough incentive to commit to a new two-year agreement, we say, but then again, $800 is awfully, awfully expensive for a standalone tablet that doesn't come with a keyboard dock. If you can do without always-on internet, Samsung is also selling a WiFi-only version of the tablet, the ATIV Smart PC 500. Now remember, since Sammy doesn't ship its products directly, you'll have to go to your country's version of the site and check which local retailers are selling what. A quick search on the US site, at least, shows that the ATIV Smart PC will soon be available in a handful of US stores, often at a more reasonable price. B&H, for instance, is accepting pre-orders for the tablet and keyboard, which together come to $750. That's more like it, if you ask us. We're quite certain that paying $700 on contract for the Smart PC is a bad idea. Fortunately for all you would-be buyers, there's already a pretty healthy selection of Atom-powered tablets offering long battery life and optional keyboards. The most promising option, as we've already alluded to, is the HP Envy x2, which starts at $850, dock included. For the money, you get the same 1.8GHz Atom processor and 2GB of RAM, along with 64GB of internal storage, an 11.6-inch IPS display and a dock with two USB ports and HDMI-out. In general, too, the industrial design is a little nicer than what Samsung cooked up. Again, though, we haven't had a chance to test the battery life, so take that caveat with you as you continue your shopping. Meanwhile, on the lower end of the spectrum, Acer is selling the Iconia W510 for $500 and up (granted, the dock is sold separately). In our extended preview, we found the build quality a bit cheap, especially with regard to the keyboard dock, which offers a less comfortable typing experience than anything else we've played with. Still, the tablet itself was nice enough, and certainly not much chintzier than the Smart PC, which costs hundreds of dollars more. The IPS screen on the W510 is also nice and, as you'll often find here, it has the same processor and memory allotment as everything else in this category, so performance should be roughly equal. Finally, Lenovo has not one, but two offerings in this space: the IdeaPad Lynx, an 11-inch consumer tablet, and the ThinkPad Tablet 2, a 10-inch hybrid for the business world. In many ways, the Lynx wins on specs, with the same processor as the Smart PC, but a lighter, 1.4-pound design and a bigger battery (6,800mAh). All told, the price is similar ($600 for the entry-level tablet, and $750 for the keyboard bundle), but it does forgo a rear camera. We're guessing that's a sacrifice you'd be willing to make. As for the ThinkPad Tablet 2, it starts at $649 for the tablet only, and accordingly comes with some slightly higher-end specs -- namely, NFC and a display that accepts pen input. 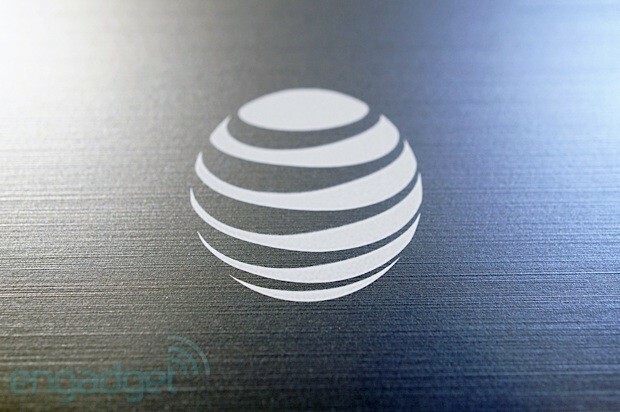 Like the Smart PC, it supports 3G / 4G connectivity, with AT&T's LTE network being the spectrum of choice in the US. Oy. We're not sure whether Samsung or AT&T is to blame, but we're sure of one thing: the LTE version of the ATIV Smart PC is a deeply troubled product. Even if you can excuse its unwieldy shape or cheap build quality, it's simply too buggy to really be useful as either a tablet or a laptop. Throughout our testing, we encountered various crashes and app-hangs, and were forced to perform a hard reset on more than one occasion. For what it's worth, AT&T says a software update is coming, but for now, at least, the performance is unreliable. Meanwhile, the AT&T version of the tablet is nothing less than a watered-down version of the WiFi-only model, which you can buy or pre-order through other retailers. Here, there's no pen support, so even if you supplied your own implement, it simply wouldn't work. The optional keyboard dock is also a troubled product, and it still isn't available through AT&T. What you get in exchange for all this are fast, reliable LTE speeds. But is that worth it when you can buy any number of other tablets with 3G / 4G data? We'll be happy to revisit the WiFi-only version with S Pen apps, but for now, at least, we're quite certain that paying $700 on contract for this is a bad idea. Update: As promised, we've updated this review with impressions of the optional keyboard dock.